When the teacher for a Scholastic Field Trip, disappears, lightning specialist, Dalton Taylor, feels honor bound to oversee the expedition for his nephew. He knows it won’t be easy to chaperone a bunch of overachievers who’ve won a spot on a rafting excursion, but feels they genuinely deserve to go. 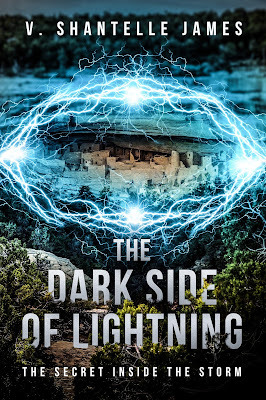 However, when a lighting storm gathers around a monument in New Mexico, Dalton’s skillset is in high demand. The sudden and prolonged appearance of Mega Lightning draws atmospheric researchers from all over the world. It’s strange that the phenomenon appears to be concentrated around the world famous Anasazi ruins. And because a national monument is at the center of the mystery, the GHCC (Global Hydraulics and Climate Center) has chosen Dalton to investigate it. When Dalton refuses to go back on his word to his nephew, his boss arranges things so he can do both. Still, Dalton can’t help but worry about combining the rafting trip with his research. Although he has misgivings, he finally agrees. As they draw closer to the phenomenon, things get tense. A stranded hiker, a woman of beauty, breeding, and intrigue, joins the group. Although captivating, she’s secretive about her past, which only adds to the list of things Dalton’s worried about. His concerns escalate when he learns the river guides are less than professional. On top of that, when communication with OGAMP (Organization for the study of Geo-physical, Astronomical, and Meteorological Phenomena) brakes down he feels like backing out of the assignment. But once on the river, there isn’t another take-out for a hundred miles. So, his only option is to see it through. Dalton takes a deep breath when they make it to the final portion of the field trip, which culminates in a hike from the river to the Anasazi Ruins. However, once inside the ruins, his worst fears come true. As events unfold, he learns the true meaning of the phrase: “time waits for no one”.